"SONGS WE DON'T PLAY IN PUBLIC"
Buttery bass-driven bumpers topped by a smoothly crooning voice, Zion‘s songs go down like sweet barrel-aged bourbon.” Zion Rodmanestablished himself as a soulful folk-rock musician in Boston. While he lived in New England, he performed at historic folk venues like Club Passim and Caffe Lena, and shared the stage with Ellis Paul and Jeffrey Gaines. Zion is currently based in Chicago, where he released his new EP Did Not Wake up Today and quickly became an integral part of the folk/rock music scene and came out in 1st place at the Uncommon Ground 2018 Open Mic Competition. Jory Avner is a singer-songwriter based out of Chicago, Illinois. Blending traditional folk style lyricism and guitar with textured synthesizers and electronic percussion he strives to create soundscapes that are both atmospherically complex and yet succinct in terms of narrative. He often performs his songs live as a solo acoustic artist. Jory is also the vocalist and lead songwriter in the folk/rock band Andretta and the president and founder of Half Glass Records. 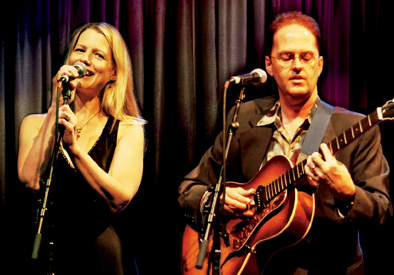 The husband and wife duo of Jenny & Robin Bienemann are both singer-songwriters and instrumentalists. By turns hilarious and heartfelt, this cutting-edge acoustic duo melds original and traditional music with an elegant hint of jazz, garnering airplay on NPR, Dr. Demento, and The Midnight Special. Jenny’s new album, “Every Soul Grows to the Light,” is a favorite of Folk DJs and has drawn comparisons to Nick Drake and Rikki Lee Jones. Robin is a 2017 Kerrville New Folk Finalist. His wild guitar stylings and outrageous lyrics inspire audiences to sing-along with songs like “Jennifer Aniston” and “Chicks Dig a Big Amygdala.” Both perform and record together and separately. Combined they have 9 albums, including Jenny & Robin Bienemann LIVE. Adela's is a folk group that draws from 60s acoustic. classical, and pop influences. Led by front woman Adela Skowronski, the group's constant theme of cello in a shifting instrument dynamic is sure gives unexpected twists and turns in familiar soundscapes. Whether its a duo, trio, quartet or solo, Adela's is sure to engage their audience and draw them into the stories that are weaved.